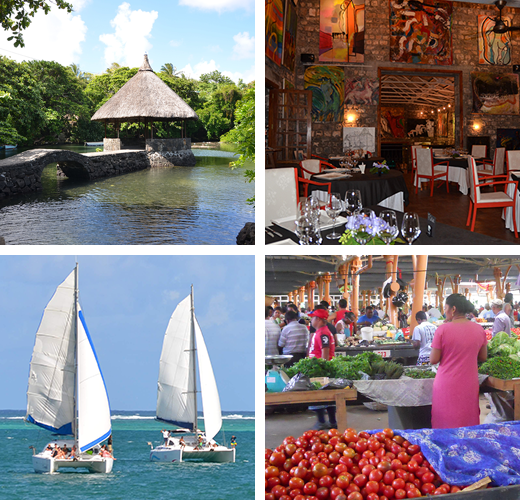 Trou d'eau Douce is a picturesque village situated on the east coast of Mauritius, with its bay overlooking the crystal waters of the longest lagoon of the island and its stunning white sand beaches. In the recent years it has faced a good touristic development, although without losing the magical laid-back atmosphere of the fishing village it was at the real beginning. It is an ideal place for people who love relax, white sand beaches and want to descover the real way of living of the local people. The house lies in a quiet area, surrounded by a large garden, with a swimming pool reserved for the in-house guests. It is located at a walking distance (10 minutes by foot) from the center of the village which hosts the following facilities: different kind of restaurants, pizzeria, souvenir shops, supermarkets, Atm machine, pharmacy, exchange office and post office. The well-known Ile aux Cerfs, with its breathtaking beaches and splendid lagoon waters, is just a short boat ride on the facing bay. The embarkation point is 15 minutes by foot from the house. Nearby the house, it is possible to reach also the most beautiful beaches of the east coast: Palmar beach at 3 km of distance, Belle Mare public beach at 7 km, and Trou d'eau Douce beach at 2 km. The bus stop is 200 m far from the house. By bus it is possible to reach the town of Flacq and the public beach of Palmar. A good service of taxis is also available to reach any destination of the island. Flacq is the most important town of the district (10km far from Trou d’eau Douce) where you can find big supermarkets (Super U et Winners) shopping malls and banks. Twice a week, on Wednesday and Sunday, it hosts a local interesting market. From Flacq bus station it is possible to reach by bus the most important cities of the island. 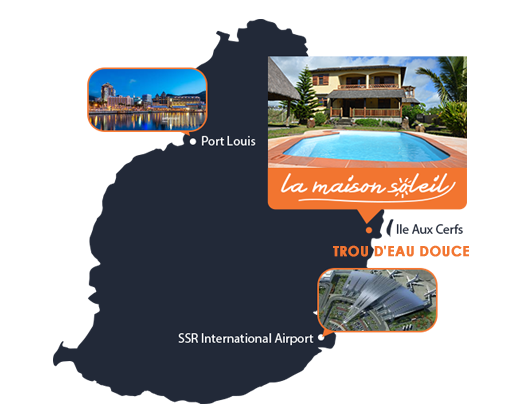 The airport is one hour drive, as well as the capital city Port Louis.